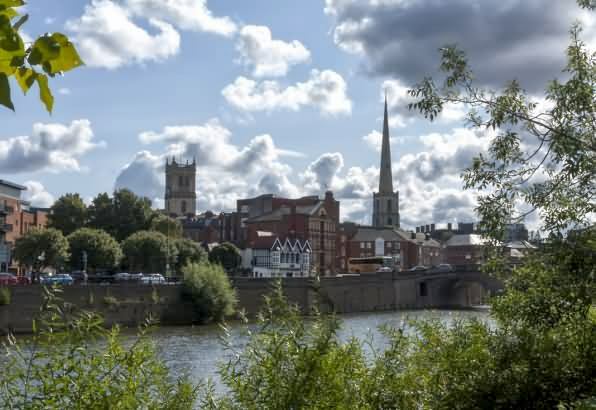 Worcester is the capital city of the county of Worcestershire and lies beside the River Severn some 25 miles from the Cotswolds and the village of Broadway (the Northern Gateway to the Cotswolds). 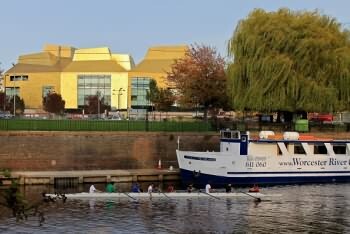 At its centre is a magnificent cathedral, perched along the riverbank, dominating the skyline for miles around. The cathedral is one of the loveliest in England and dates back to Norman times. The early 12th century Chapter House, St. Wulfstan's Crypt and the mediaeval cloisters are among the most remarkable in the country, and King John's tomb in the Cathedral dates from 1216. Just to the south of here lies the site of Worcester's 11th-century castle. 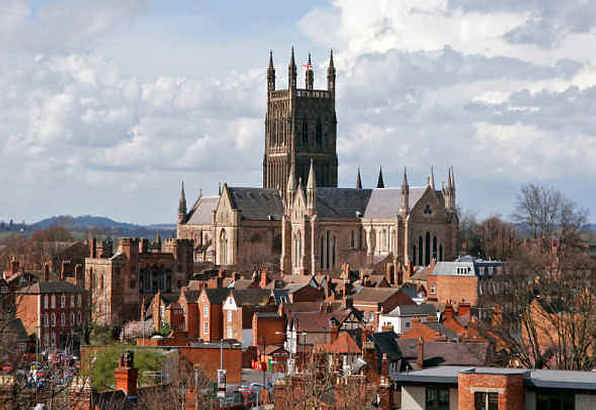 Although possessing all the sophistication and amenities of a city, Worcester with its attractive jumble of medieval, Tudor, Georgian, and modern architecture has the feel of a small town. It’s particularly easy to explore and get around – both on foot and using public transport. Three minutes walk from the cathedral takes you to the famous Royal Worcester Porcelain Museum and adjoining factory. Nearby, you can wander along medieval Friar Street, full of restaurants and bars nestled within original timber buildings. Greyfriars, a merchant's house built in 1480 next to a Franciscan Friary, is now a National Trust property, and several other historic buildings of interest are situated nearby: the elegant Guildhall of 1721; the Commandery, which was King Charles's headquarters in the Battle of Worcester; the City Art Gallery and Museum; Huntingdon Hall, Worcester's premier live music venue; and the Swan Theatre. All well worth a visit. Worcester is home to a prestigious, ever-growing university, which recently unveiled one of the city's most exciting modern buildings – The Hive. Constructed using sustainable materials and designed to operate on renewable energy, The Hive is the first joint public and university library in Europe. With over a quarter million books and 12 miles of archive collections, it's a thriving centre of learning and also hosts regular events including public lectures, exhibitions and performances. There are many sites of interest to explore in the country outskirts of Worcester. Just west of the city centre is the Elgar Birthplace Museum, which provides fascinating insight into the life and music of this foremost English composer. Ten miles north west, situated beside the amazing baroque church of St Michael and All Angels you’ll find Witley Court, a spectacular ruin that was once one of England's great country houses. A few miles east of the city is Spetchley Park, 30 acres of gardens and deer park, and south of the city is the National Trust’s Croome Park, Capability Brown's landscaped masterpiece. Worcester is surrounded by some of the most beautiful country landscapes in England. 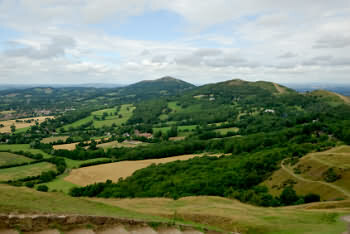 Most notably the Malvern Hills, which tower gracefully above the river and city and have been described by some as a mountain range in miniature. The eight-mile ridge is perfect for walking – be it gentle rambles or a clamber all the way up Worcestershire Beacon, treading in the footsteps of George Mallory who walked there in preparation for his Everest climb. The ascent is worth the effort for at the peak, 1,395 feet up, you can spot 13 English counties. 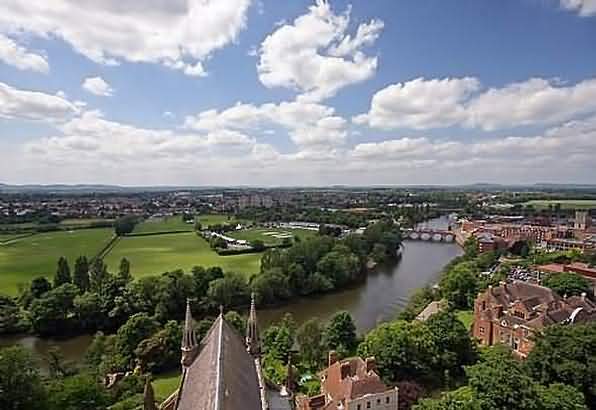 Occupation of the site of Worcester dates back to Neolithic times when a village surrounded by defensive ramparts was founded on the eastern bank of the River Severn around 400 BC. 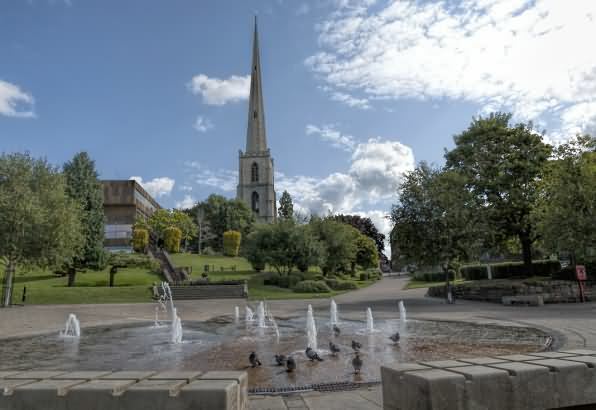 An important cathedral city for a thousand years, Worcester has played its part in shaping Britain today and it was a key battleground in the English Civil War, site of the epic final battle in1651 when Oliver Cromwell’s army defeated King Charles II's Cavaliers. 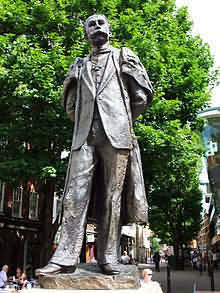 Worcester is the birthplace of the composer Sir Edward Elgar (actually in the village of Lower Broadheath 3 miles outside Worcester) and also where the British Medical Association (BMA) was founded in the Board Room of the old Worcester Royal Infirmary building in Castle Street in 1832. Throughout the years, Worcester’s fortunes were based on glove making, pottery manufacture (Royal Worcester Porcelain), salmon fisheries (long gone), and the famous Worcestershire sauce, which was first sold in 1838 by John Wheeley Lea and William Henry Perrins (Lea and Perrins), dispensing chemists from Broad Street. They later built a large factory, which is still the main production site for the sauce today. The term 'Dicing with Death' comes from a Worcester court trial of two soldiers. The judge in a lenient mood had them roll a dice and whichever rolled the highest number would be set free and the other was given the death penalty. The Berrows Worcester Journal newspaper, published in Worcester, is the world's oldest surviving newspaper. King John's main body is buried in Worcester Cathedral, his bowels are buried at Croxton Abbey and his heart at Croxden Abbey. St Andrews Spire, locally known as 'Glover's Needle' is the steepest and tallest spire in England. Hindlip Hall (4 miles from Worcester) was designated, in the event of German invasion in World War II, as the relocated home of the government. The Mug House pub located in the Worcestershire village of Claines (3 miles from Worcester). The pub is one of only two pubs in England to be situated on consecrated church ground and where access is via the graveyard. See - Mug House Pub. Famous for the recipe of Worcester Sauce by city residents Lea & Perrins. Work started on the present cathedral in 1084 and continued unabated for 100 years. In the centre of the chancel, in front of the high alter, is the tomb of King John between the shrines of St. Wulfstan and St. Oswald. On the south side is the tomb of Henry VII's eldest son, Prince Arthur. Located outside the ‘old’ city walls, The Commandery is a grand l5th-century timber framed building, with a great hall decorated with murals and supported by a fine hammerbeam roof. Originally built in 1085 by St. Wulfstan, it was later restored in the l5th century and used by Charles II as his headquarters during the 1651 Battle of Worcester. The Commandery has exciting stories to tell you about power, greed, war, wealth, romance, death, society and industry. Step back in time to catch a glimpse of the lively characters that have inhabited this ancient building during the past seven centuries. 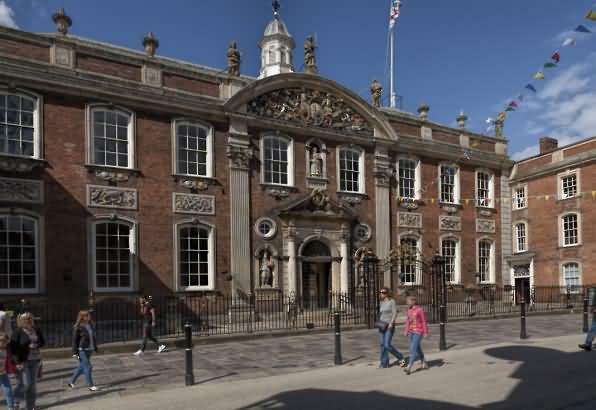 Worcester is home to a number of interesting old houses and Guildhall, designed by Thomas White (a pupil of Sir Christopher Wren), is one of the most gracious Queen Anne buildings in the country. Statues of Charles I and Charles II greet visitors at the entrance and a carving of Oliver Cromwell’s head is nailed by the ears above the doorway, reflecting the city's historical Royalist allegiance (once known as the 'Faithful City'). The Guildhall is open 6 days a week and the public may view the Grand Italianate styled Assembly room with its collection of portraits.Six rooms are also available for hire, so the Guildhall can accommodate events ranging from meetings for 12 people to private catered functions for up to 200 guests. The Guildhall is wheelchair accessible with disabled toilets. 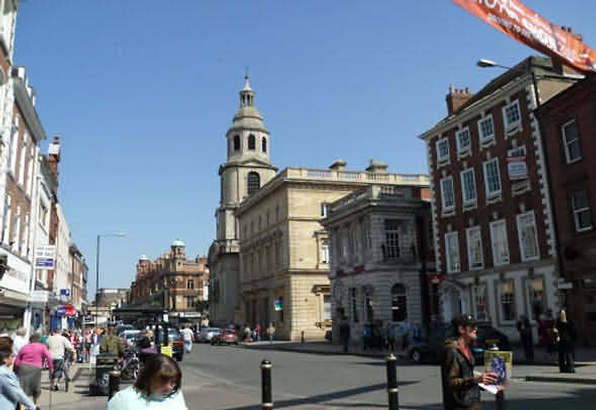 The Worcester Tourist Information Centre is located in the Guildhall and there is a restaurant on the first floor providing good lunches. One of the most beautiful timber-framed and tiled houses in Worcestershire, Greyfriars, located on Friar Street, dates from 1480 and is now owned by the National Trust. Set in the heart of historic Worcester, Greyfriars House is a stunning merchant’s house where you can get away from the hustle and bustle. This unique house and garden was rescued by two extraordinary people with a vision to rescue this medieval gem and create a peaceful oasis. Open to the public. 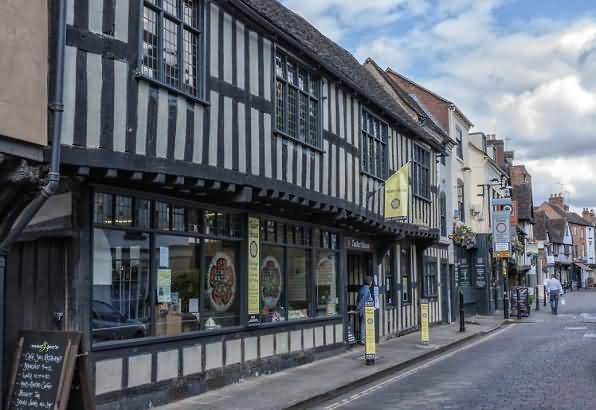 Also on Friar Street, this 500-year-old timber-framed building is now a fascinating period museum depicting life in the city from Elizabethan times. 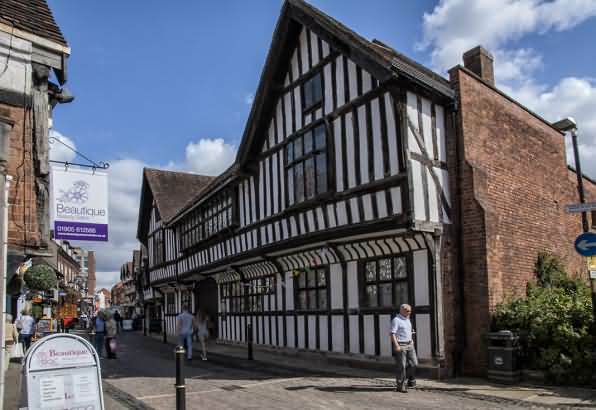 Standing in the most historic street of Worcester, Tudor House is a wonderful building of timber beams, leaded windows and decorated plaster ceilings. Inside you will find rooms almost five hundred years old, not crowded with furniture but open for you to see. A few choice exhibits (some of which you can touch as well as look at) are complemented by fascinating interpretations of the history of this ancient city. Here you’ll find exhibits of contemporary art, local archaeology and social history, including a 19th-century chemist's shop. Civil War relics are also displayed. Worcester's principal art gallery and museum hosts a unique programme of contemporary art exhibitions, as well as housing a historic picture collection and an intriguing selection of objects ranging from a 19th century chemist's shop to the wonderful Worcester sauce machine. The porcelain produced here ranks with some of the worlds greatest. The museum houses a magnificent collection of porcelain and is well worth visiting. The Museum of Royal Worcester houses the world's largest collection of Worcester Porcelain. The ceramic collections, archives and records of factory production, form the primary resource for the study of Worcester porcelain and its history. A few miles east of the city centre lies Spetchley Park, overs 30 acres of lovely landscaping and walled gardens appreciated by professional and lay gardeners alike. A Georgian house in a deer park with a lake and a Victorian garden. The gardens were largely designed by Rose Berkeley (grandmother of the current owner) and her sister, the great Edwardian gardener, Miss Ellen Wilmott. They comprise a Georgian House, Deer Park, Garden Lake, Herbaceous Borders, Fountains, Walled Gardens - and is widely described as a 'Plantsman's Paradise'. For more information see - Spetchley Park Gardens. A few miles south of the city centre is Capability Brown's first complete landscaped park. Discover miles of walks through lakeside gardens, shrubbery and open parkland, decorated with islands, bridges, a grotto and wonderful Robert Adam buildings. Restored 1940s RAF buildings house the visitor facilities. The parkland has been transformed. Once a garden hidden in the undergrowth, they have been restored it to its 18th-century hey-day. Walk through the enchanting shrubberies which lead you to dramatic views with temples, bridges, follies and statues waiting to be found around every corner. For more information see - Croome Park. Elgar Birthplace Museum - Crown East Lane, Lower Broadheath, Worcester WR2 6RH. Within a quaint English cottage at Lower Broadheath, three miles east of the city discover the history, music and inspirations of one of England’s most famous composers. The Elgar Birthplace Museum offers a fascinating insight into the life and music, family and friends, and musical inspirations of Sir Edward Elgar, whose masterpieces include Salut d’Amour, Pomp & Circumstance, the Enigma Variations, and many more.The Museum has two buildings, the modern Elgar Centre and the atmospheric Birthplace Cottage. Together they reveal the great man behind the music. Witley Court - Worcester Road, Great Witley, Worcestershire - WR6 6JT. The vast, spectacular ruins of this palatial Grade 1 listed building are surrounded by magnificent landscaped gardens and huge stone fountains. The site is located 10 miles north west of Worcester. Witley Court's extensive gardens are some of the most romantic of those in English Heritage's care, but the fact they exist at all is a miracle. Once one of the grandest country estates in England, it has endured many dramas including a devastating fire in the early 20th century. Its future was secured in the 1950s and today visitors can enjoy formal gardens with a spectacular lake, a French parterre with its massed planting and a vast fountain of Perseus and Andromeda carved from Portland stone. St Michaels and All Angels (Great Witley church) has been described as being one of Britain’s finest Baroque Churches. It was built in 1735 and has a magnificence that is unsurpassed in a Parish Church, it serves both Great Witley and Little Witley. Great Witley Church displays a splendour which is unique amongst country churches in Britain, with exquisite gilded decorations throughout, numerous paintings byAntonio Bellucci, ten painted glass windows depicting scenes from the Bible, highly decorative carving and a large monument by Rysbrack. It also has a fine organ, its case being from the instrument upon which Handel played. For more information see - Great Witley Church. At Kidderminster, 15 miles from Worcester take a scenic journey back in time. Perfect for the whole family, an outing by steam train is a lovely way to appreciate the sights of the local countryside. For more information see - Severn Valley Railway. 3rd Sunday each month, 9am to 3pm. Held annually over the last weekend in August from Friday to Sunday. Free to attend.